Are you looking for an easier way to grow your distribution channels? Find and connect with thousands of new global and local agents and resellers in one simple step. List market rates for instant bookings and guaranteed commissions, or negotiate rates for individual contracts. Raise your profile and grow revenue faster with access to global OTAs (online travel agents) such as Viator and Expedia. Discover new business partners with complimentary products to expand your customer offering. Cut back on admin and avoid overbooking with automated updates on tour and activity availability across all your distribution channels. Find your existing agents already on Rezdy to streamline processes. Get help transitioning others onto Rezdy to make your life easier. 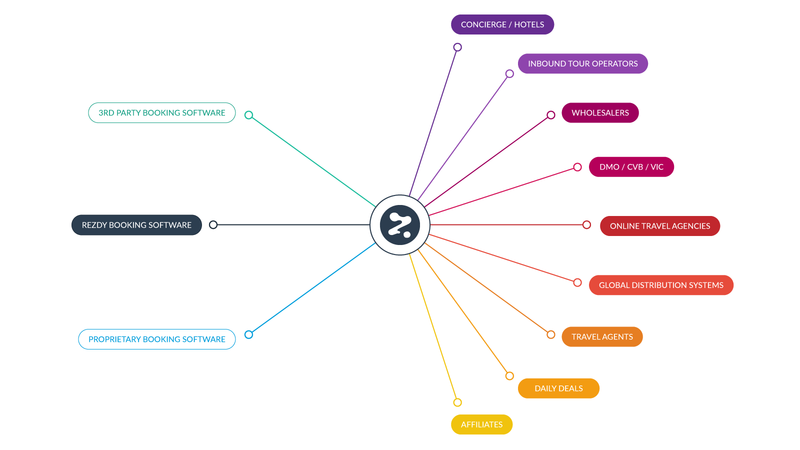 Rezdy Channel Manager works with any existing booking platform. Manage all your channels with a single API, or connect directly through Rezdy booking software. Enjoy peace of mind that your booking volumes, commission levels and other vital data is safe throughout, with the world’s largest independent Channel Manager for tours and activities. Choose from a listing of over 80,000 quality tours and activities ready to embed on your website from the world’s largest live inventory. Check availability and get instant confirmation on bookings 24/7. Manage all your channel relationships through a single platform. Get paid on time with automated agent commission payments. Get clear reporting on commission payments by source, per order, product and date to give you the insights you need to make better decisions.